What happens when the Bible is undermined in a person's eyes? I'm going to give you some actual examples of false gospels contrary to the biblical Gospel, but first let me just emphasize that apostasy taken in conjunction with the other signs of the end times adds emphasis to the fact that the day of the Lord's return is drawing near. We are not far away, I do believe. A professor at Dallas Seminary where I attended put it this way, "Those of us who will follow Christ and His Word as opposed to the rising emphasis upon religious experience will increasingly become a smaller group, until one day we will be on the outside of the American Evangelical Church looking in." This is what we are in route to as I speak. I now want to give you a sampling of the evidence. I say sampling on purpose because if I was going to give you a full exposition we would be here until midnight. So, I'm going to be quick and I'm going to summarize some of the bigger points. Let's begin with the Bible. Foundationally, there has been an undermining of the Bible. It began with the higher criticism that came into this country in the late 1800's and early 1900's. At that time basically "enlightened" thought was applied to the Bible and the inspiration and the inerrancy of Scripture were rejected out of hand. Scripture writers were considered mere editors that spliced together earlier man-made documents. Basically, the Bible was not viewed as the Word of God but rather was the word of man. And, by the way, the miracles were deemed as myth. It's like they took scissors and started to just cut those miracles right out of the Bible. Fast-forward to today. Bart Ehrman is a person who studied at Moody and Wheaton, but then he went to Princeton and got all messed up. He says now that the New Testament manuscripts have many mistakes. This is a guy who went to Moody and to Wheaton. "Human fingerprints are all over the Bible," he says. "The idea of an inerrant Bible is denied." It gets worse. There's the Jesus Seminar. Let's look at John Dominic Crossan. I don't just read these apostate's books, but I go to hear them in person. I've actually sat under his lectures and listened to what he had to say. He among others at the Jesus Seminar say that the New Testament is unreliable, and of the many statements in the Gospel attributed to Jesus, only 18% were likely uttered by Him. Jesus didn't say the majority of what the New Testament said. He also said that nearly all of Jesus' sayings in John's gospel are judged inauthentic. Jesus just didn't say those things. Even Christian theologians are now combating the Bible. There's a book written and published just last year by my friend Norman Geisler. It's called Defending Inerrancy. In his book sadly he documents a number of evangelical scholars who are publishing books that undermine the inerrancy and inspiration of Scripture. This should not be! It should not be, but it's happening. The Bible bashers are now within the gate. Here's the thing. Once the Bible is undermined, the domino effect occurs and you'll see all biblical doctrines begin to fall away. After the Bible is undermined, that means all other doctrines in the Bible are undermined. For example, today there are some Christians who are saying that God is not all-powerful and all-knowing. That explains the problem of evil, you see, for evil is so bad in our world that we must conclude that God is a good God but that He's just not strong enough to bring about a good world. So, God is not all-powerful. In terms of salvation, lots of Christians today are now claiming that Jesus might not be the only way, which we'll get into more later. Some Christians are saying that Jesus was not perfect and that He made mistakes while He was on this earth. These are the kinds of heresies that we are seeing penetrate the Church. There's a man you've probably seen in the news named Jerry DeWitt. He's been in almost every newspaper in the country. He was a former pastor in the Bible Belt. The problem of evil disturbed him, and so he came to believe that there is no God. That's apostasy! He joined up with a group that has become very popular online called The Clergy Project. Based on their website, we read that it's a confidential online community for active and former clergy who do not hold supernatural beliefs. It helps members move beyond their former faith. And, it also helps them to "come out", aiding them in how to tell their families that they no longer believe. Another very popular website is Recovering From Religion. On their website we read, "If you are one of the many people who have determined that religion no longer has a place in their life but are still dealing with the after-effects in some way or another, Recovering From Religion may be just the right spot for you. The primary focus of Recovering From Religion is to provide on-going and personal support to individuals as they let go of religious beliefs." The very fact that there is a market for these kinds of organizations tells you that there is an apostasy taking place. Many former pastors are joining up with this kind of heresy. 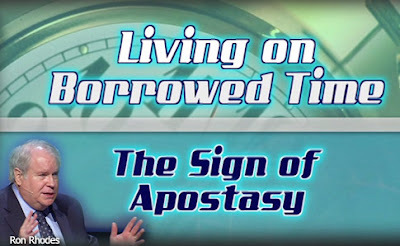 In the fourth segment of Dr. Ron Rhodes teaching on apostasy as an end times sign, he will explain why the book The Shack is filled with heretical teachings. Just like to add that on the history channel a new "show" called Bible Secrets Revealed and others like it giving question to the truths in the old and New Testament. Also in a bookstore in my state the Bible is put in the fiction section and labeled with a price tag saying fiction. Disturbing times. But Jesus warned the world would hate us because we are in him. Come soon Lord Jesus!